1. 1 cup channa daal. 3. 1 tsp cumin seeds. 4. 2 tsp coriander powder. 5. 1 tsp red chilli powder (optional). I kneaded the dough in curd. If you don’t want to use curd then use milk or water. Curd/milk gives a white texture to the dough and the taste of the dough becomes almost like a white flour (maida). The dough should neither be very soft nor be very stiff. 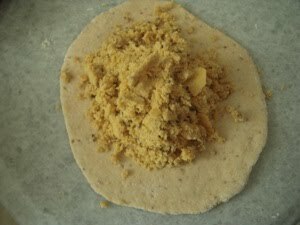 Always remember that the chapathi dough is the softest, puri dough is the stiffest and the paratha dough is in between. For 1 cup wheat flour, mix 2 tsp ajwain seeds (carom seeds). They impart the kachori flavor to this paratha. 1. Pressure cook 1 cup channa dal in 1 and a half cup water. Do add in little salt. Cook for 3 -4 whistles. When dal is done we do not require excess water. So if water is there then just cook the dal without the lid and evaporate all the water. You can also strain the water and keep it aside. You can use this water to make chapathi dough but don’t use it to make dough for this particular paratha. 2. In a pan, take 1 tsp oil and add cumin seeds. When they splutter add the dal mixture. Add turmeric, coriander power, red chili powder and salt. Mix well. 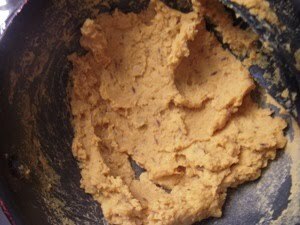 You need to cook the mixture till it becomes completely dry and forms a dry dough. 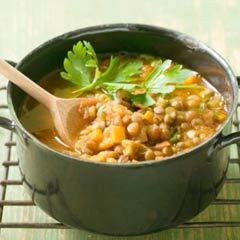 Also mash the dal so that any whole grain is not left. While stiring keep pressing and mashing it to make it smooth. It cooks very fast, so all is done within 5 minutes. You need to keep moving the spoon else the mixture will stick. Use a non stick pan for this.If you feel like adding any other spices to this, feel free to do so. Let the mixture cool down completely. 3. Now roll the dough, put a heap of the mixture. The mixture should be more. Make a ball and then roll out the paratha. 4. Grill the paratha. Once it is grilled. Add ghee on both sides and cook well. Don’t make the mistake of avoiding ghee. If you use 1/2 tsp of ghee per paratha its good enough. I never gave up on ghee and there no need for you to do so. If you don’t like ghee you can use oil. One trick for oil/ghee is to dip the spoon and let the oil fall back in the container, now use the back of the spoon on the paratha. 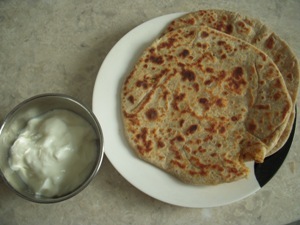 This way less oil/ghee is used to make the paratha. 5. Serve hot with curd. They can be put in the fridge as everything in these paratha is cooked well. They taste good even when they are cold and they freeze beautifully. What else one need for a meal. Wash all the dals, add enough water, garlic paste, and turmeric simmer till very soft. (A pressure cooker will save time). Add salt and mash well. Hard boil the eggs, peel and prick with a tooth pick all over. Heat the oil in kadai. Add onion and fry tilllight brown. Add tomatoes and fry till they are reduced to a pulp. Add the eggs and continue frying till the eggs are roasted and the onion mixture is brown. Add chilies and about 1/2 cup of water. Add salt to taste. Simmer gently for 10 minutes. Add the dal. If the mixture is too thick, add a little water. Give one boil and remove from heat.